Estlean Cook’s machine tooling company is thriving today, partly because she made a decision years ago to cater to larger corporations. “If we hadn’t, we probably wouldn’t have survived the first five years,” said Cook, whose company’s client list now includes Lockheed-Martin and “quite a few” larger companies in addition to Michelin. What happened at Treblig is similar to what happens with other small businesses around the country, according to a survey by a New York-based think tank. Becoming a corporate supplier is typically a springboard for growth. It’s a way for small companies to thrive. In its “Giving Small Firms the Business” report, the Center for an Urban Future in New York said it surveyed nearly 200 small businesses in New York and 14 other states. Among the survey’s findings is that corporate contracts can offer small businesses quick opportunities to grow. 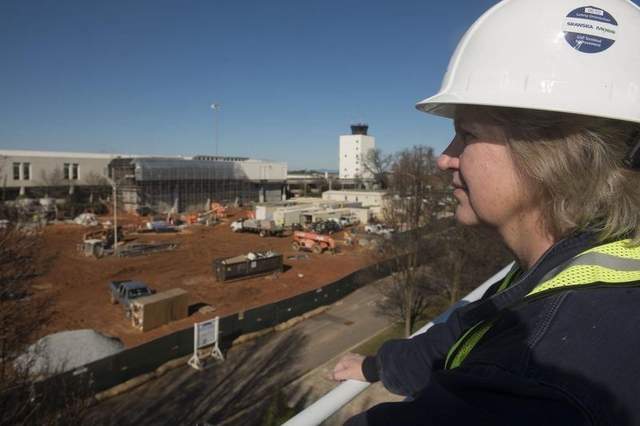 That opportunity is one of the benefits Tone Nichols is anticipating as a result of her company’s involvement in the Greenville-Spartanburg International Airport’s $115 million terminal improvement renovation project, known as Wingspan. Tablerock Technologies LLC, a Pickens-based solar energy firm that Nichols founded in 2002, is equipping GSP with solar panels to heat water in the facility. Tablerock has four employees and is still reeling from the impact of the economic downturn, Nichols said. So work on the Wingspan project is “a big deal,” she said. “Bringing in small businesses like me for the Wingspan project is a huge, huge economic boost for all of us,” she said. The exposure Wingspan gives companies like Tablerock Technologies is a big asset when it comes to bidding on similarly large projects, said Janet Christy, business counselor with the South Carolina Women’s Business Center. “It’s sort of like you can borrow money if you don’t need it,” she said. Having a company like GE on your client list not only gets you noticed but shows you have some credibility, Morton said. “I think it’s made other companies realize they can trust us. A lot of times, with a small business, especially a young business, trust is a big deal,” she said. The U.S. Small Business Administration also recognizes that access to the corporate supply chain helps small businesses strengthen their revenue streams. But breaking into that chain can be a challenge, SBA Administrator Karen Mills said. For Morton, it was difficult and frustrating. On one side is the corporation. Its purchasers and buyers have so many people who want to talk to them that it’s hard to get to everybody, Christy said. On the other side of the coin are the suppliers. Many times, they’re reluctant. “Maybe they don’t feel like they have a shot at it, so they don’t even try,” Christy said. While a lot of times a small business won’t be able to sell directly to a corporation like BMW, they might be able to sell to their suppliers, which also tend to be large corporations, Christy said. “So a lot of times, either a small business is reluctant to even try, or they go straight for the top when that’s not really where they fit. They don’t know or don’t understand to look down the supply chain to see where is the best place for them to insert themselves,” she said. The SBA now offers a way to lessen the challenge for both businesses and corporations. Last fall, it announced the launch of Supplier Connection, a free, online portal created by the IBM Foundation designed to help bridge the gap between small, nimble businesses looking for new opportunities and large corporations looking for innovative new ideas and diversity in their supply chains, the administration said. BMW Manufacturing in Greer also offers a solution to connecting small businesses with larger companies. The company’s annual Supplier Diversity Matchmaker Conference, held at the TD Convention Center, gives women and minority business owners the opportunity to network with its first-tier suppliers. “We feel like it’s an advantage,” said Louise Connell, a BMW procurement specialist and organizer of the company’s Supplier Diversity Matchmaker Conference. “I have several emails from different minority-owned companies that say, ‘If nothing else, you opened the door for us. We’ve called several times to these suppliers and couldn’t get an appointment, but because of this diversity matchmaker event, we were able to at least get our foot in the door,’” Connell said. Small businesses that want to connect with larger corporations should be prepared for what’s ahead, Christy said. Be willing to go through the process that large corporations require of companies they select as their suppliers. You may have to register in their database or make some kind of contact with them, Christy said. A lot of times, there is a credit check, and they will want to see that you’ve supplied whatever you’re proposing to them to someone else, she said. “You need to respect their process and follow it because it’s actually part of the test,” she said. Small businesses also must be ready to meet the corporation’s demand. “You couldn’t go to a corporation that wants to buy things in units of 3,000 and you only supply 500 at the time,” Christy said. Morton advises small businesses to not be afraid to push and ask for what they need. “Don’t be afraid to ask people for introductions. In the South that seems to work best, when people know someone,” she said. And, like Christy, she recommended doing the best job you can and deliver as promised. “So many people don’t do that and they hurt themselves,” Morton said.